The living legend, Ron Marchini, returns for his most enjoyable movie to date! Steve Parrish (The Marchster) returns home to the San Francisco area after his many travails fighting in Central America. All he wants to do is see his young son Zak (Nicholas). However, gang boss Petroli (Landingham) has it out for Parrish. He sends all the baldest, fattest, oldest goons after Parrish to exterminate him. But Parrish is one...clever...man. Somehow they manage to kidnap Zak, so Parrish teams up with his love interest Teri (Lynn O'Brien) to fight the baddies and save Zak. Shortly after that, he finds Zak and they team up to take on the bad guys! Also, corrupt government agent Carruthers (West) has his own stake in both the fates of Petroli and Parrish. Where do his true loyalties lie? 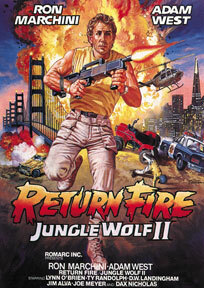 Return Fire: Jungle Wolf II is way, way more entertaining and fun than it has any right to be. It's fast paced, almost in spite of itself. 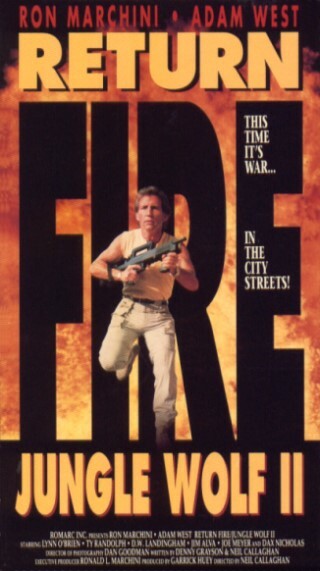 The movie kicks off with a bang with the rockin' tune "Return Fire" (seemingly a knockoff of Dokken's "Into the Fire") over a montage of clips from the first Jungle Wolf (1986). Before you can say "30% New Footage", we're thrown into an inexplicably long action/chase scene with absolutely no explanation of what's going on or why any of this is happening. Also, as if that wasn't enough Marchini gives some deadpan narration (just in the beginning of the film, and written by Paul Kyriazi) which doesn't really help matters. If anything, it confuses them further. Then there's another montage to another fist-pumping rocker ("Fight to the Finish", both songs by the band Gunslinger) as Carruthers leaves an answering machine message! The pacing and structuring of the film, as well as the non-acting, gives the impression it was made by children with no formal moviemaking experience. No matter, just throw a hammy Adam West into the mix and you truly have a recipe for insanity. How could it NOT be totally insane? Marchini bellows "Where's my boy??!!!???!!" with more enthusiasm than ever before, and, the first half of the movie at least, predates Ransom (1996) by eight years. The whole movie has a screw loose and this is further compounded by the absurd music cues. They blare on at inappropriate times and feel very Scooby-Doo-ish. (Isn't the name "Old Man Carruthers" even from Scooby-Doo? )I think they were lifted from such TV classics as Adam-12 or The Rockford Files. Sure, it has some classic cliches as Carruthers saying to Parrish "We go back a long way", Parrish going on "one last mission" and the famous abandoned warehouse, Petroli's hideout. Landingham gives his best-ever performance as Petroli. Sadly, Landingham passed away this past June in his and Marchini's hometown of Stockton, CA where a majority of this film, and other Marchini classics, were lensed. Sadly, this is director Callaghan's only directorial effort. What could he have created had he been able to continue? For that nutty feeling only AIP movies can provide, Return Fire: Jungle Wolf II delivers the goods in spades. I stumbled onto this accidently. Im Joanna Landingham, D.W. Landingham's daughter. Just wanted to thank you for the nice words about my dad. We're coming up on the two year anniversary of his passing. This made me smile. What a nice comment! Thank you so much for taking the time to write to us. We're fans of your father, we watch his movies and we are trying to tell the world about them.